The Hearth Project in Mayo — which brings art into the homes of older people who are isolated geographically or restricted for other reasons — has received funding from Healthy Ireland for 2018. 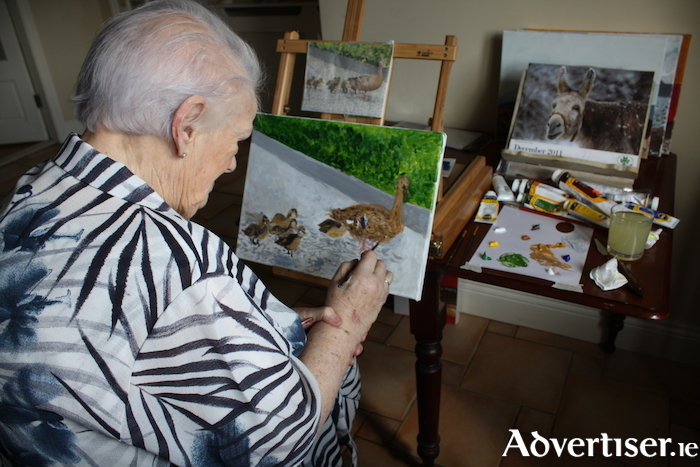 Each participant is visited by a skilled artist who is experienced in working with older people. The artist travels to the home of the older person weekly and facilitates a one to one workshop there. Hearth operates in Mayo with the support of Pobal, the Department of Health, Mayo LCDC, the Healthy Ireland Fund, and in association with Mayo County Council. The participants are guided and mentored in the process of making drawings, paintings, looking at art books, and looking to nature for ideas and inspiration. Hearth has previously operated in Belmullet, Achill Island, and the Ballinrobe and Claremorris areas since 2009. This project aims to find ways of enhancing old age and believes that the most powerful antidote to the sense of loneliness and hopelessness that can accompany ageing lies in the life and power of the mind. The world of the arts can uplift the human spirit at every stage in life, but is especially effective for those in old age. The new Healthy Ireland funding will enable the project to be reactivated temporarily in the Belmullet and Ballinrobe areas in Mayo. The Hearth project has significantly impacted on positive mental health and social inclusion of vulnerable people. It is hoped that this run of the Heart project will develop into a feasible model for longer term mainstreaming of this initiative. One former participant in the project from Belmullet said of it: "I never believed I could do all this with my left hand. When I finish a piece I wonder how I did it. It breaks the monotony. There is always an element of surprise, I have surprised myself. It takes my mind off what I can’t do." Another said: "I didn’t think I was capable of doing a painting, but I’ve surprised myself. I do find it relaxing. It’s something to look forward to really, to have someone come into you is great. I wouldn’t have even attempted it without the guidance and encouragement."